Duoc is a proud member of local rugby team ‘The Flash’ and has yet to missing a training session, despite his many responsibilities at home and school. Duoc is 12 years old, and lives in northern Vietnam. Living in a remote, rural community, where living standards among local families are poor, Duoc is already shouldering a great deal of household responsibility. With his parents often working away from the family home, Duoc is responsible for housework and taking care of his 9-year-old brother. Every day, he wakes up early to feed the chickens, and prepares breakfast for himself and his brother. After school, Duoc visits the local shops and market to buy food to cook dinner for the two of them. For Duoc, ChildFund Pass It Back offers an important outlet – the chance to spend time outside the home, to play, to learn and, most importantly, to be a child. And despite a shortage of free time, Duoc has yet to miss a training session with his team, known as ‘The Flash’. A player with ChildFund Pass It Back for over a year now, Duoc is already a huge fan of the game. He says: “I love playing rugby! I’m happy that I get to be active, run around and play with friends. During the Planning for the Future season, Duoc learnt about strategies to save money and to make plans, something he found simple yet extremely practical for his daily life. “Sometimes when my parents were not able to send money to me in time, I would go catching crabs and frogs and sell them for grocery money. For each catch, I usually earn 88,000 VND (around $4USD) at the very most. The Planning for the Future curriculum also gave Duoc some ideas on how to juggle the many activities in his day, such as going to school, attending training and undertaking household chores. “I usually go to school in the morning, practice with my team ‘The Flash’ in the afternoon, and then I go home to cook dinner. Duoc’s father is so impressed and proud of his son. “Every time I come home, I see him a lot more mature. He’s more agile and animated, he now knows how to better manage the household chores and the spending, and to take care of himself and his brother. His health is also improved. 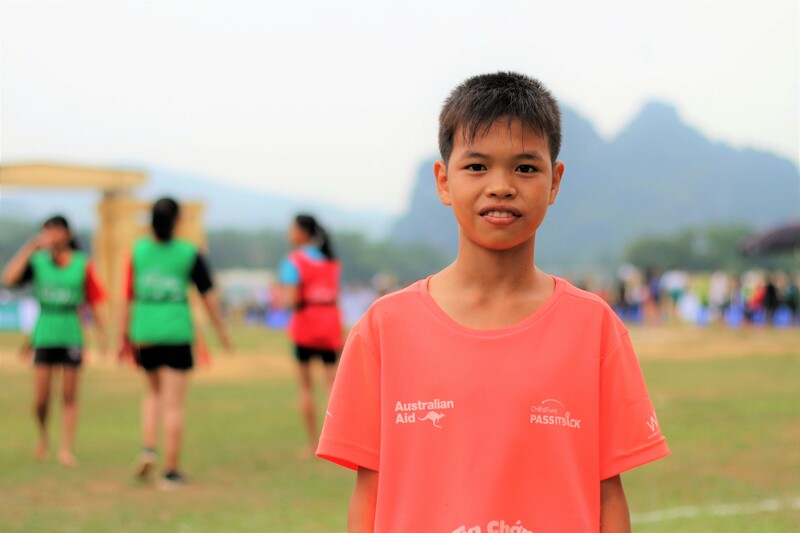 Duoc has yet to open his piggy bank but he already has a goal for his savings: he’s hoping to have enough money to buy a new pair of boots for training with his friends!